Mrs. Emini-Watch can’t believe I like the movie Highlander. What can I say, I’m a sucker for mid-80s films. I’ll admit the choice of Christopher Lambert, a French actor, to play a Scottish medieval lord was odd. But back then he was hot property, having just done Greystoke and Subway. Anyway, in Highlander Lambert plays an Immortal, battling other Immortals to the death by beheading. (Yes, starting to see Mrs. Emini-Watch’s point.) The film climaxes in modern-day New York where the few remaining Immortals are drawn to ‘The Gathering’ – to fight each other so that only one remains to take ‘The Prize’, ultimate power and knowledge. OK, enough movie trivia. What has this got to do with Emini trading? Just one of my favourite little patterns and one of the best ways to spot a high probability trade. A ‘Gathering’ is a cluster of blue Professional bars just below a previous Resistance level, where they’re getting set for a jump across Resistance into an uptrend. Mostly I look for these patterns on 500 tick charts. And mostly I look for them before breakouts into uptrends – but they should be equally valid for breakdowns into downtrends. 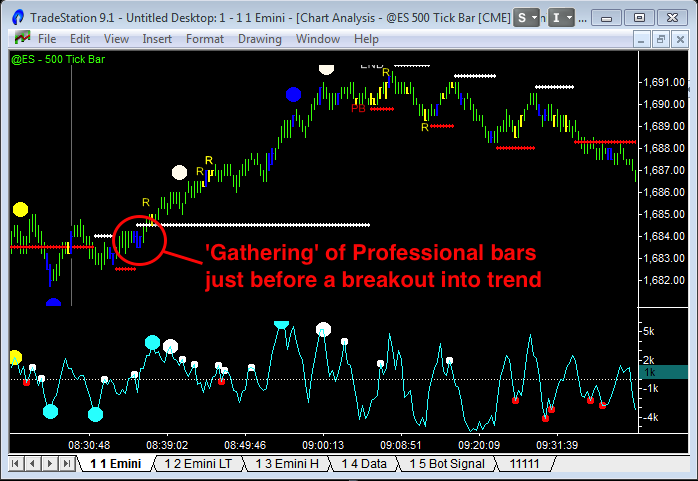 The video above shows a great example of a ‘Gathering’ pattern from today’s Emini trading. And the image above is a screen grab of what happened. Why does this pattern work? What is going on? In general I like to say: Amateurs trade breakouts, while Professionals fade breakouts. So you’ll often see Amateur activity at the top of a channel, looking for a breakout into trend that then fails. And sometimes that false breakout comes with a RAMBO pattern (Reversal of Amateur BreakOut). But there are trend breaks that do work. And the common feature of these is that they have Professional “support” – the Professionals have taken their positions in anticipation of the trend break. So, in the case of an uptrend, look for Professional bars on the dips, where the Lows of those bars hold and the price activity breaks above the Highs and keeps going. And just before the trend really gets going, that’s when you’ll often see Professionals anxious to buy any little dip just under a previous pivot point or Resistance level – getting ready for a decent trend break. And that’s ‘The Gathering’. Confirmation is when the price activity breaks above the Highs and then breaks through the Resistance level (and keeps going).